Siena is one of Italy’s most captivating cities, with its concentration of medieval and gothic architecture and charming small town appeal. Located in Tuscany, about an hour south of Florence, Siena offers a treasure trove of art and architecture to the culture vulture, and fabulous food and wine for gourmet travelers. Siena has a fascinating history. As Rome, Siena has a foundation shrouded in legend. It’s said that the son of Remus, Senius, founded Siena. All around Siena you will see references to the she-wolf nursing Romulus and Remus. Historians theorize that the city was actually founded by the Etruscans. The Etruscans were an advanced culture in Italy who preceded the Romans. Archaeologists have found that the Etruscans used irrigation, sewage and drainage systems, all before the Romans. In fact, the “cloaca maxima, “great sewer” of Rome is actually Etruscan. The first Roman roads, diversion channels, and drainage systems were Etruscan. Interestingly, the Etruscans are also credited with introducing the architectural arch (used for bridges, gates, and vaulted alleyways). After the Etruscans, the Romans turned Siena into a military post and called the colony Saenna Julia. The colony seemed to disappear and some historians think Siena may have been ruled by invading Gauls for a short period. Christianity was firmly rooted in Siena by the 4th century and the Lombard Kings invaded Tuscany and Siena in the 6th century. Siena became a flourishing trading center under Lombard rule as it was on the main trade route and pilgrimage route to Rome from the North. The Via Francigena was a major road built during this period, linking Rome to France. The Lombards surrendered to Charlemagne (King of the Franks, who later became the Holy Roman Emperor) in the 8th century, and the Franks briefly ruled Siena and quickly married into the aristocracy. The clergy took over for the next few centuries and Siena became deeply religious. Siena finally declared itself free from Episcopal control in the 12th century. Over time, the city became extremely prosperous due to new industries such as money lending, and the emerging wool trade. The beautiful Duomo cathedral was built in the 1100s and the graceful Piazza del Campo (the main square in Siena) became the central meeting point for its inhabitants. Markets and sporting events were held and the beautiful Gothic Palazzo Pubblico and the Torre del Mangia were built in the square. The Black Death arrived in 1348 and devastated Siena, decimating its population. The next two centuries were relatively stagnant for Siena’s importance as it was bogged down with political instability and constant fighting. Despite this, trade and commerce carried on and the famous bank of Monte dei Paschi di Siena was founded in 1472 (and is still in existence today). The Republic of Siena finally surrendered to Florentine Cosimo de Medici in the late 1500s and was incorporated into the Grand Duchy of Tuscany. In 1861 Siena along with the rest of Tuscany, was absorbed into the newly formed Kingdom of Italy. Today Siena lives off finance and tourism and is indeed one of the prettiest and most interesting Italian cities to visit. It is also a good hub and close to the wine country of Montalcino, Montepulciano, and Chianti, not to mention endless beautiful medieval hamlets and towns such as San Gimignano, Volterra and Monteriggioni. Wining and dining is a must in Siena and its nearby hamlets! Grilled radicchio, zucchini with anchovy sauce, fettuccine with truffles, roast baby lamb (Agnello), minestrone soup, Pici pasta (similar to spaghetti), roast rabbit (Coniglio) and roast capon, bruschetta doused in Olive Oil and fresh tomatoes, wood-fired Chianina steak and omelettes with bacon are all delicious dishes found in Sienese homes and restaurants. 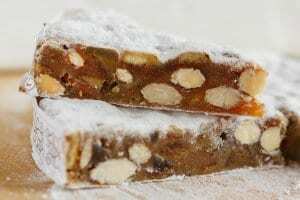 The town also has a sweet tooth and Panforte (a concentrated fruit and nut cake) is the classic dessert, usually served with the sweet Vin Santo wine. Cantucci almond cookies and chestnut based desserts are also common. Siena is literally surrounded by wine producing regions. To the north lies the Chianti Classico region, the main wine villages including Radda in Chianti, Gaiole in Chianti and Castellina in Chianti. Top producers include Badia Coltibuono, Capannelle, Montevertine, and Castello di Volpaia. To the northwest, there is a tiny appellation outside of San Gimignano for its white Vernaccia wines. South of Siena is lovely Montalcino and its superb Brunello producing wineries. In the southeast, you will come across Montepulciano, another fabulous medieval town famous for its Vino Nobile wines. 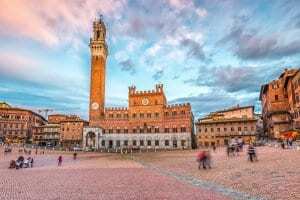 The main square, Piazza del Campo is an unusual shape, similar to a fan or a scallop and is famous for being the venue for the medieval annual horse race, the Palio. Historians think it may lie above where a Roman forum was. There are nine divided areas of pavement, which represent the Council of Nine who ruled Siena in the 1300s. The main streets in Siena all lead to this square and when you visit Siena, it is impossible not to gravitate towards it. The lovely fountain “Fonte Gaia (“happy fountain”) dates back to 1346 and has panels based on originals by Jacopo della Quercia. This beautiful Gothic masterpiece dominates the Piazza del Campo with its bright orange terracotta it seems to glow at sunset. Inside you will find the Museo Civico and its wonderful art collection. Just next to the Palazzo Pubblico is the Torre del Mangia bell tower, over 180 feet high (which you can climb up). This Gothic church is one of the prettiest in Italy, with its multicolored zebra-striped marble façade. The building took centuries and was finally completed in the 14th Century. 40 great artists contributed to the Duomo and you need a few hours to take in all of the paintings, sculpture and decorative details. The cathedral’s major attraction is its stunning inlaid marble floor with detailed Biblical scenes. They took 200 years to finish! The Carousel Pulpit is another attraction in this outrageously beautiful church and was sculpted by Nicola Pisano in 1265. The Sienese had actually planned to enlarge the church, but after the city fell to the Black Death plague, the plans were abandoned. Homemade Panforte cakes, artisan Cantucci cookies, antiques, art prints and of course wines and olive oils are all great gifts. The University of Siena was built in the 13th century and is still one of Italy’s most important universities in Italy!